Attorney Ray Ybarra Maldonado and Dr. Angeles Maldonado. Ray did not really want to be an attorney. We met with the shared love for organizing and civil disobedience. We wanted to organize, to fight for human rights, and to simply work towards making a difference in the world. In fact, on our first date I told him that I hated lawyers because every time organizers wanted to do an action, they told you why you could not do it instead of how you could. I told him I also hated law students, because they always thought they knew everything. He agreed with me, without mentioning he had also gone to law school, and not just any law school but to Stanford Law. I, strangely, had also aspired to go to law school, but with my low LSAT scores I was never able to gain admission at a reputable school. Yet years later here we are now, I never thought I would have a PhD and a business card with the words “Chief Executive Officer” under my name, or that Ray would become Abogado Ray, and lead a law firm whose sole mission is to be the best law firm for Spanish speaking, immigrant, indigenous and Latino families in Arizona. The Law Office of Ray Ybarra Maldonado was born in a quest to reinsert integrity and ethics into the legal profession that serves Spanish speaking communities in Arizona. As community organizers in the immigrant rights movement, we grew up observing the ways in which our community relied on attorneys for guidance and leadership. At times, our people were at the mercy of the legal opinion which always deemed to weigh heavier than that of anyone else. But what finally did it, was an incident near 36th street and Thomas. Ray and his sister Amber and I were following an MCSO vehicle during the infamous Sheriff Arpaio neighborhood raids. MCSO would drive around and literally detain anyone who was driving while brown and give them an infraction for minor violations such as a broken tail light. That stop, however, would quickly convert into a deportation. We watched helplessly as community members would be handcuffed away to be disappeared from the neighborhoods in which they had raised their children, and made a life for themselves and their families. It was in the middle of this emotional space of trauma, that we witnessed the ways in which some attorneys were quick to dismiss our community’s pain. Dr. Angeles Maldonado and Attorney Ray Ybarra Maldonado starting up the grassroots organization, PUEBLO. It became evident on one of those days, that Ray would be taking the bar exam and become a licensed attorney. Like most things Ray does however, he wanted to be different. He didn’t want to immediately open a law firm without first knowing how to be a great attorney. In law school Ray learned and debated theories of justice and human rights, but they didn’t focus much on how to be a practicing attorney at Stanford Law School. Instead of opening our own firm, Ray decided to first get experience working under others who had already honed their craft. He began working for the Law Office of Farrokh Parsi, a Harvard educated immigration attorney with a stellar reputation. He then went to get trial and motions experience working as an Assistant Deputy Public Defender in Cochise County. He then went on to work as an Assistant Federal Public Defender defending immigrants and people of color charged with federal criminal crimes. Ray was approached by an attorney who wanted him to open his office for him in Phoenix, working in the areas of immigration and criminal law. This was an opportunity to return to Phoenix to be closer to our families and the thought was that it would provide Ray with a great opportunity to use his skills in both immigration and criminal law. However, when Ray began working at the law firm he quickly realized that the attorney was more interested in taking people’s money than the actual legal outcome. In fact, Ray saw first-hand the damage that could be caused by a law firm that was robbing the community as opposed to helping. After two weeks, with no money in our bank account, we felt that our morals and integrity meant more than a paycheck and decided the only option was to open our own law firm. We wanted to have a law firm that our community could trust, that was ethical, and guided by integrity and the principles that our families taught us. We desired a different law firm, focused on service and respect, while being fundamentally grounded in the community. We decided that our mission would be to take cases that focused on “reuniting families, and keeping them together.” Fast forward six years and we now have recently launched the “Ybarra Maldonado Law Group” doing criminal, immigration, civil rights and personal injury. We also have a new partnership with attorney Jazmin Alagha; forming Ybarra Maldonado & Alagha. Our law group is determined to grow, and grow big. We aspire to completely change the landscape in the legal profession for those who are serving the Spanish speaking community in Arizona. By increasing the value we add to those we serve, by understanding the importance of family and communication, we desire to raise the level of service across the board. Most importantly, we wake up every day with the goal of adding more value to the people that we are fortunate to serve. We believe strongly that we are accomplishing just that. What does it mean to create a revolutionary law practice? I believe it comes back to the roots of who we are and most importantly having a strong mission statement. Our law practice, like our identities will always straddle borders and contradictions. While we are certainly and foremost a business, the soul of our practice has its roots in our community and it’s needs. We seek to always stand alongside the fight of our people. We believe it is our duty to take direction and follow the leadership of those on the ground, to support social movements and campaigns, to show up in the streets, and wherever we are needed, and to provide what has become an anomaly within the legal profession; a positive experience with an attorney. The legal system under the veil of supposed neutrality is cold and heartless and simplistic by design. Many of our current laws are rooted in deeply racist ideologies to uphold White Supremacy. We are no fools to this reality, and so our goal is to help navigate this system in defense of communities who exist in the margins of our society. We know that our communities are intentionally targeted, criminalized, and made to feel disposable. We face the reality of fighting within a justice system that lacks justice for people of color. We are made to rationalize and make moral arguments on behalf of families whose sole crime is to cross an imaginary line in their quest to escape poverty and provide better opportunities for their children. We are on the side of those whose life chances were determined before even being born. We advocate on a daily basis for people who have experienced such extreme violence that the “crimes” they have committed are only a direct result of the crimes that were committed against them. We fight bureaucratic and established experienced institutions on behalf of those we represent. Regardless of the type of case, or the scenario, we have attempted to build a law practice that is committed to understand. We strive to complicate and raise questions to expose the reality that people don’t exist in boxes and their fates and futures should never be black and white. We live in a state where the odds are usually against us, yet we are determined to fight and overcome. We want to be a team that people can come to and know that we will fight as aggressively as we would fight if they were a member of our own families, because they are. The community we serve is our gente. The families that come to our doors are people with whom we share not only a language, and a culture, but a struggle. We strive to persevere alongside them. But that is not enough. We recognize, as we have entered spaces of privilege that we have an opportunity to not only facilitate the legal process for our people, to not only advocate for them, but that we have an opportunity and an obligation to restore a level of dignity into the interactions they have to have in their quest for justice. We are certain, that if they could, they would wish to never have had to call a lawyer in their life. Our clients and their relatives find themselves in a place of need, of stress, of pain, or of frustration, and now here they are having to show up to some law office to talk and divulge details about their experience, and relive many times the pain without the proper psychological support they deserve. Or in the case of an accident to deal with paperwork after paperwork, instead of focusing on healing. Knowing this is the lived reality of the families we serve, we try to create a space that is not only welcoming and easy but that reflects a high level of professionalism. We think about details that we hope add value to their experience. As you navigate through the difficult legal system, we want to ensure you are delighted with our service. Ray and I love nice hotels, we love how beautiful they can be, and the attention to service that they provide. Disneyland is a key inspiration for us. Their team is committed to deliver happiness and this mission is woven into all of their practices. We pay attention to places like these and are constantly thinking of how we can apply what works to our law firm. We strive to always Find A Way To Say Yes (FAWTSY). Our reception area always has cold fruit-infused water, fresh coffee, hot water for tea, and organic fruits and healthy snacks. We play nature sounds so that when clients step into our doors they feel a sense of calm. We also have a children’s play room, because we understand that childcare is hard to find. We have strategically hired people who understand customer service and let go of those who don’t. Our people always come first. We believe it is imperative that our families have proactive communication with the attorneys or paralegals assigned to their case. We believe communication is essential to trust. We also hire people who have great hearts and a passion for service. We know knowledge can come with experience, education, and training, but heart is not as easy to learn. At the core of who we are is an understanding that we have the privilege and honor of waking up every day to be serve. We don’t have to work, we get to work, and that makes all the difference. We don’t want to work with people who are simply there to collect a paycheck but instead look for people who are motivated by factors greater than themselves. We are an intentionally all bilingual law firm consisting of people who get it. Our people are some of the most dedicated individuals, full of heart, full of passion, intelligence, drive and most importantly full of humility. We believe we all share a commitment to social justice for the communities we serve because we all come from this community. Trauma does not exist in isolation. Many of us have been impacted by the social impact of deportations, by discrimination, by the incarceration and criminalization of those we know and love, by the reality of generational trauma, and/or simply by being witness to the many narratives of struggle we hear from those we have the privilege to represent. At Ybarra Maldonado Law Group, we don’t just speak Spanish, we have an understanding and cultural competency that is integrated into the way we serve and represent families. While society can continue gentrifying our neighborhoods and appropriating our food, culture, and language; we know there is power in our stories. Our history and lived experiences are not up for translation. We hope people know that there is a law firm that is here for them in a genuine way, and that we wake up every day with the mission to keep on working on improving the way we do business. Our community deserves better. They deserve an honest opinion from an experienced, educated, and committed attorney they can trust. They deserve to be treated with dignity and the utmost respect even in times when they can’t give that to us. They deserve an ethical law firm that gives back to our collective struggle for social justice and human rights. But most importantly, they deserve a team that is bound to make mistakes, but is not afraid to rectify them and to wake up every day with enthusiasm and pride to not just show up, but to show up ready to work, ready to be uncomfortable, ready to be disturbed, ready to face doubt, ready to be shaken, but always always ready to fight and grow. We don’t always get it right, but we have faith that our effort to consistently reflect on our practices will make us successful. We hope that so long as our daily routine consists of small steps towards our vision, we will come closer and closer to creating a revolutionary law practice; and be the best law firm for immigrant, indigenous, and Latino communities in Arizona. But more importantly than who we become, we hope our narrative can influence and/or help raise the standards for how other law firms do business in Arizona. 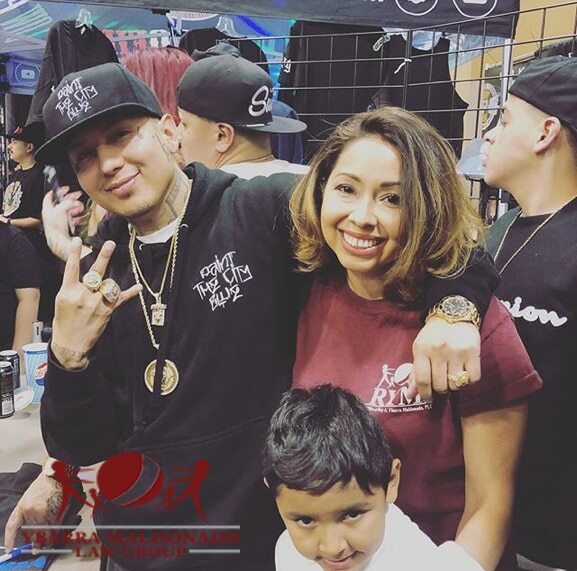 King Lil G, Dr. Angeles Maldonado and Ray-Ray at the 2018 DUB Show Custom Car Show Tour. The crowd smiled with enthusiasm. I think it really comes down to doing just that, putting in the work. In the path to success, there’s no shortcut to hard work. We can’t forget where we come from either. So as we look forward, I hope we can continue with the same determination and humility of King Lil G. We are not leaving this place either, we are committed to move things along and keep on fighting. Day in and day out. “Living in Arizona and fighting for immigrant rights is not easy, we lose more than we win” Ray often says, but it is also the home of so many beautiful resilient fighters. We take pride in being unafraid to stand alongside and fight with our community members. It may not always please Judges, Prosecutors, or Insurance Companies, but at the end of the day we aim to please those we serve, not those who are seeking to abuse, deport, or imprison our community. May we continue to straddle borders together and in solidarity; always.